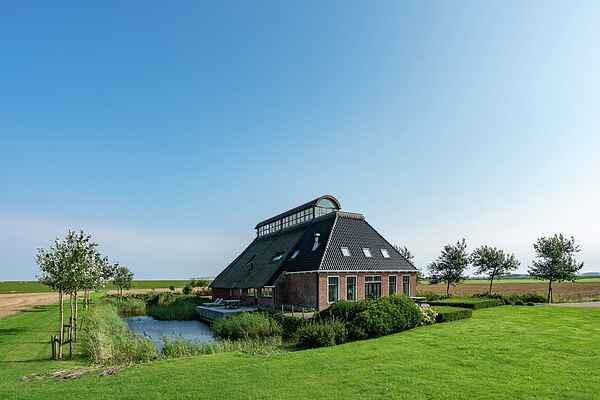 This holiday farmhouse enjoys a unique location directly behind the Wadden Sea dykes in Nes (Dongeradeel, Friesland). The Wadden islands are on the other side. You will find luxury, quiet and relaxation at this location at the tip of Friesland. You can nicely pamper yourself, because it looks like a spa here: the holiday home features two saunas (Finnish and infrared), a jacuzzi and a hot tub: defy the cold and go bathing outdoors! The Wadden islands are calling you! You can easily take a day trip to the two Wadden islands, Ameland or Schiermonnikoog. The two floors of this holiday farm consist entirely of glass and conceal a small apartment with a kitchenette, a seating area, a romantic four-poster bed: you sleep under the stars! If you stand on the balcony and look carefully, you will see Schiermonnikoog and Ameland in the distance. The house is a good base if you like walking, cycling or water sports. The Lauwersmeer is about ten kilometres from the holiday home, surrounded by lovely countryside. The lovely village of Dokkum is twelve kilometres from here. You can also take a walk along the dunes or cycle tour from the holiday farm. Bikes can be rented in the village. A trip to cultural Leeuwarden should certainly not be missed. Want to extend your stay? Ask about the options.